Enjoy regularly scheduled public transit service into Yosemite National Park and the gateway communities along its routes in buses that are air-conditioned and equipped for rider comfort. Access the park on multiple runs each day, year-round. There is also daily service from Mammoth Lakes, on Highway 140 through Mariposa, and Mono County during the summer (typically June through September), when Tioga Pass Road is open. Reservations are not required to ride on YARTS. 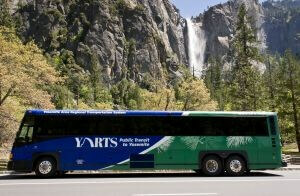 Your entrance fee to Yosemite is included in the bus fee and child’s fare is free with one paying adult. See ticket prices here. YARTS stops at many hotels along the way to Yosemite on Highway 140. There are several stops near hotels in Mariposa and two stops at hotels in El Portal. Ask your hotel how close the nearest YARTS stop is when you make your booking and leave your car at home. In Yosemite, YARTS makes contact with all shuttle services including the free Valley Shuttle and the free Tuolumne Meadows Shuttle (summer only). Check the YARTS Trip Planning page & the Bus Schedules page for more information about making all of these connections.